With only a few days until our country's birthday, this month's Stamp of the Month "American Celebration" couldn't have timed out better. Check out all the images in this fantastic stamp set in the right hand column of my blog. 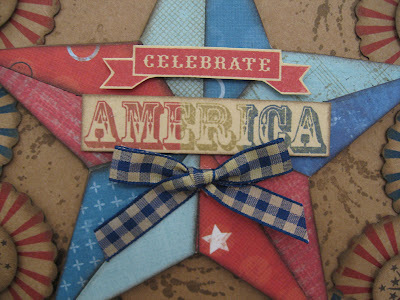 The Close To My Heart Stamp of the Month Blog Hop begins today with over 60 consultants participating. And I can't wait to see all the great ideas they have come up with. If you're already hopping, you've come here from Dawn Heuft's blog. Keep scrolling through my post to see where to go to next. If you'd like to see some of the steps I took to create this, read on. If you're in a hurry, simply scroll to the bottom of the post for the next link in the blog hop. It all started with a circle of wood about 6 1/2 inches from my local craft store. 99 cents each. I chose wood so that I would have a solid sturdy base for the project. 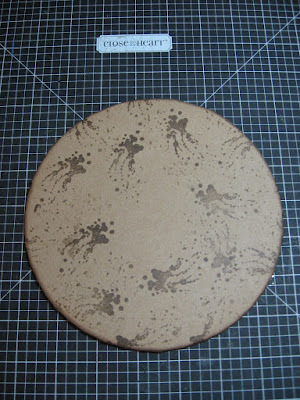 After covering the front and back with Kraft card stock, I stamped these splatters from the "You Rock" stamp set. Stamping was done with Cocoa ink. I cut a large star out of spare chipboard scraps and applied red and blue pattern paper, inking all edges with Cocoa ink before adhering. Using CTMH's 2-inch scallop circle punch, I punched out 18 circles from Kraft card stock. 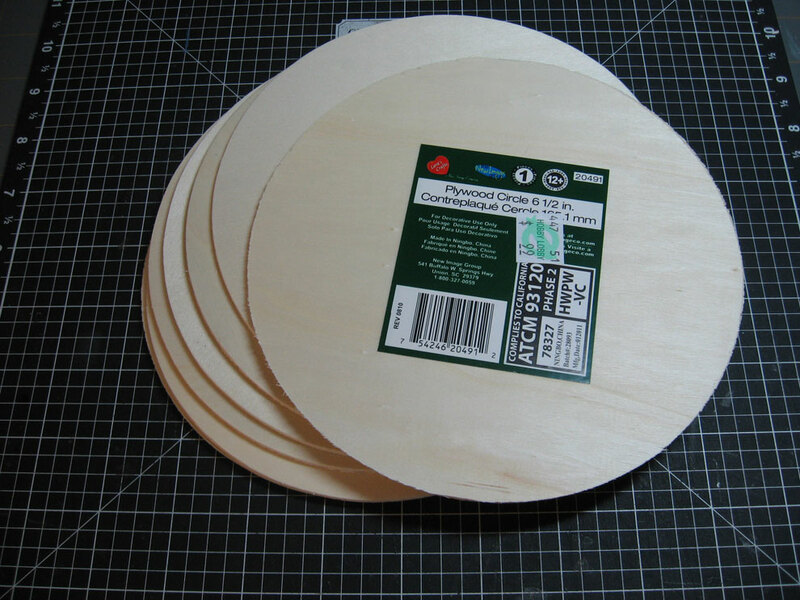 Then 12 smaller 1-inch circles for the centers. I stamped 12 of the scalloped circles with Moonstruck ink and the other 6 with Cranberry using the image from the American Celebration Stamp of the Month set. I then cut the Cranberry ones in half and overlapped them over the blue ones. It's not perfect stamping, but inking the edges with Cocoa fixes all that. 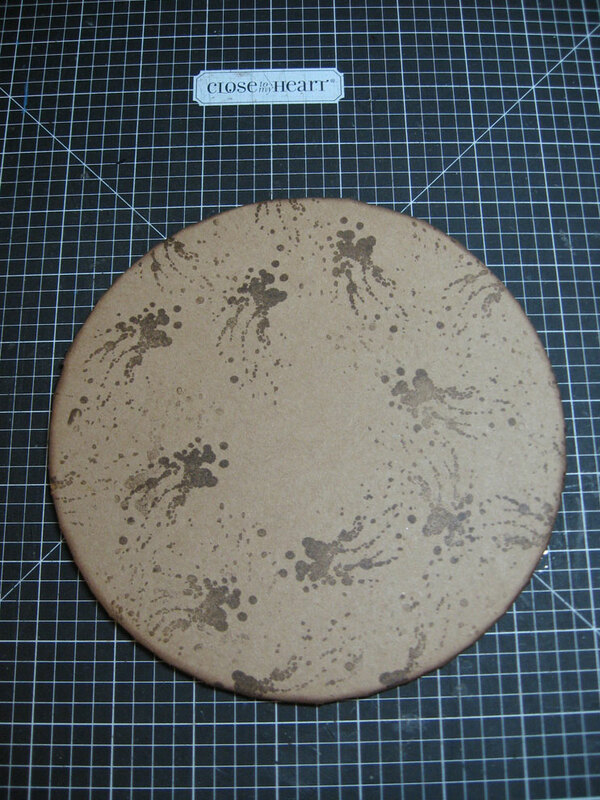 The small circle is stamped with Cocoa ink, using an image from the featured stamp set as well. I added a silver brad to the center of each and popped up with small circle with foam tape, then adhered the units to the circular base alternating the red and blue sides, overlapping each slightly. America and Celebrate have been stamped onto Bamboo card stock pieces. America was stamped in three tones by first inking the stamp in Desert Sand ink, then the first part of the word in Cranberry, then the ending in Moonstruck. I huffed over the inked stamp to make sure it was well-moistened, then stamped the image. Voila! Here's another look at the overall piece. Thanks for stopping by today. Now keep on hopping over to Vickie Tagatz's blog to see what she's created. Then hop along until you come all the way back to me. Have fun! Question for you . . . how do you participate in the blog hop? Is there a place to sign up? I'd love to try it one month. TIA for any info you have! Annette this was such a fun project to make at your club. Thanks for sharing, it looks wonderful on my fireplace mantel. As always, amazing work! This project is full of vintage charm! Thanks for showing us how to make it. Once again I'll have to stop by the craft store because of one of your posts - LOL! So cute!!! I might have to try that. Wow, amazing as usual Annette! LOVE your work! WOWZERS! This is beautiful!! I so appreciate all the time you took to show the technique!! Wow, what a lot of work. And it looks fabulous! What a neat project! Wow! Beautiful. What a wonderful idea for a new door decoration! Gorgeous! 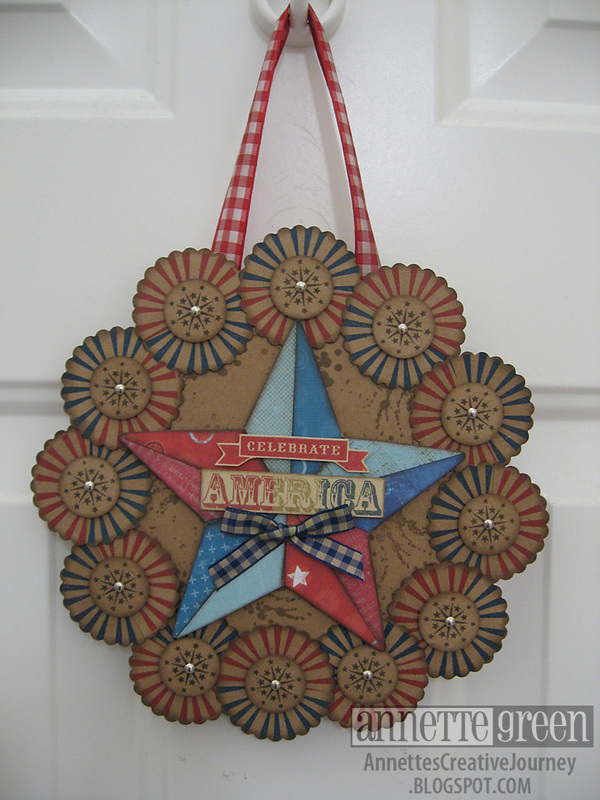 I just love how you made this look so Americana! the colors are perfect! Love, love, love your project! You "win" the project of the month for me this time!!! Way cool and now I'm off to get the wood base to create my masterpiece, giving all credit to you of course!!! I really like this project! Great instructions--did you free hand he star? 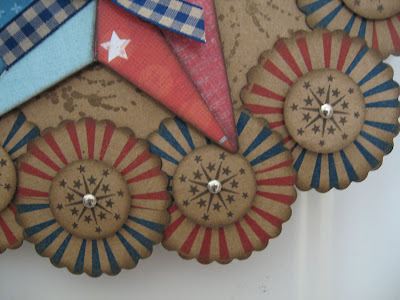 Or did you use some pattern, it just looks so perfect especially when you added the red and blue B&T's to it. Thanks for sharing this! Thanks to all! Very nice comments indeed. 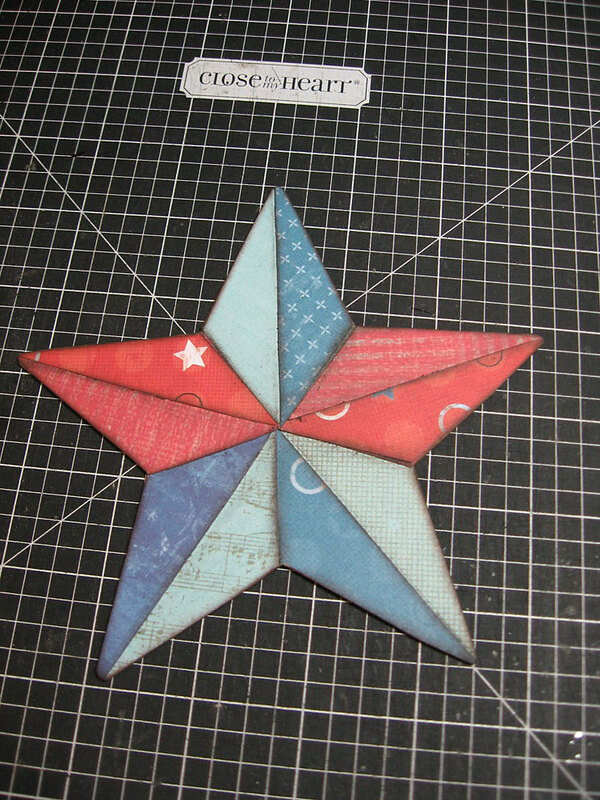 Karen, to answer your question, I printed a star from my computer onto a piece of card stock and used it as a template to trace onto chipboard. DYNAMITE!!!! Wowsers! Totally amazing & inspirational. Thanks for sharing the details on how to recreate it. WOW, you truly never cease to amaze me!! I AM in AWE!! Fantastic decoration!! WOW! Your wreath is amazing and so festive! Thanks for showing us how you made it. Happy 4th of July!